So much has been happening that we have not had time to update this website till now. The fiercely hot weather and recent tragic murder have caused general stress but our optimism about developing a useful collaborative relationship with RBK remains undimmed. We are now in active discussions on how we might pilot the Community management of the Halls on CRE and Cambridge Gardens. Our joint working with CRERA and CRESt under the “Three Chairs” banner continues to enable us to represent the interests of all our members both on and off the Estates, particularly in respect of Regeneration. Our work with CREst to assist those who are homeless and have mental health problems in Norbiton continues and we are are providing meals and support to about fifty every Tuesday from 12.00 to 15.00 in Piper Hall. Out of this has come the initiative to set up a Community Pantry and RBK has generously just opened up the unused room next to our Madingley Hub for this purpose. Congratulations to our new Councillors! One Norbiton would like to congratulate our three new Councillors on their recent election. One of our own Directors, David Ryder-Mills was elected as was Emily Davey, our MP’s wife and Olly Wehring. They have all helped us with our mission to improve quality of life in Norbiton. As many of you know it has always been our hope to be able to collaborate with our Council in addressing the many problems experienced by our members who number all those who live, work and study in Norbiton. We wish the new Council, now led by Cllr Liz Green, all the very best in coping with the many difficult tasks they have ahead of them. Overall Aims – To unite our community so that the North and South work together. To support an appropriate mix of Social, Affordable and Owner-occupied housing, in particular press for an increase in the amount of necessary Social housing, particularly for singletons, older persons and disabled and that any future regeneration plans command both community and cross-party support. to enhance the appearance of Norbiton and preserve our existing green spaces and to develop a Hogs Mill riverside walk. To create better transport links e.g. to enlarge the K bus route to include the CRE to help our elderly get easier access to Kingston Hospital. Also to promote health by encourage safe walking, cycling and use of public transport and seek ways to avoid traffic congestion e.g. explore the feasibility of developing a car free estate. To promote the Health, Education and Physical, and Mental development of all residents (including the young and the elderly). To run regular Post Code parties to improve mutual community contact and engagement. To manage the nuisance caused by local street drinkers and focus on the Homeless. To set up and support a local youth club. To develop a Community hub that facilitates joint work between public services such as Housing, Social Services and the NHS. And to run an Internet café to support the Community needs for using the Internet and provide a common meeting ground where Charities and others can collaborate. To scrutinise local public money spend and ensure it is used in the most effective and economic way and in the best interests of those who live, work and study in Norbiton. Specifically, to develop ways in which Health, Social Care and Housing Budgets can be employed to work together rather than be rigidly hypothecated. The AGM will be held in the Smaller Piper Hall. Hopefully it will not be too long a meeting. I attach the paperwork below. Mike, 37, is a softly-spoken, very likeable man who is now one of the many homeless living on the streets of Kingston. He has lost contact with his family and and feels understandably bitter that his two young daughters have started calling another man “Daddy.” He suffers from periodic bouts of emotional instability and personality change all complicated by controlled alcoholism. Just before Christmas, as the temperature fell below zero, Mike, together with the other homeless, became eligible for statutory night shelter from KCAH. However, in the morning after this, when it was still zero degrees, he and his friends had to be turned out onto the streets again. Perhaps, due to this stress, Mike became acutely anxious and this triggered his irritable personality disorder and he started falling out with his friends. It was while Cambridge Estate’s local community charity, CREst, was giving him a hot meal that this got worse and he eventually collapsed in despair in the Loo. Phone calls were made to all available local homeless services but none of them could provide him with any Day care. So he had to leave with his equally stressed friends back onto the freezing streets. By now, not surprisingly, he had become so deeply depressed that he was actively suicidal and shortly after had to be admitted urgently to the, equally overcrowded, Springfield Hospital under section. Our two local community groups, One Norbiton and CREst, were powerless observers of the unhappy saga above and only able to provide Mike with emotional support, warm clothing and groundsheets. What happened to him is unfortunately the norm and clearly could prove fatal. Therefore, we are presenting the following a survey of all the homeless encountered by us in Norbiton during 2017 in the hope that sharing this information may improve things for Mike and his friends before next winter. 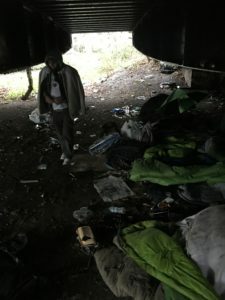 In 2015, we, our Ward Councilors and other voluntary and statutory agencies began meeting under the Chairmanship of RBK’s Neville Rainford to try to evolve a better way of helping a small group of homeless Street Drinkers who had been moved out of the centre of Kingston by the police and were causing a nuisance in Norbiton. Rather than just trying to move them on again, we wanted to explore alternatives to look after them in Norbiton. Finance was obtained by our Ward Councilors with all-party support in the Council and an interesting survey was done on classifying them as well providing supervised work for them to construct a memorial garden for children in the Cemetery. Then in Spring 2016 a small addiction recovery group called BOB (Build on Belief) was failing to attract much support and one of us (Angel Levick), who had been homeless herself, tried inviting her friends to come for a regular hot meal each Thursday lunchtime. The word got out and quite quickly this event expanded. Knowing our local Community group CREst was already running a Mental Health Drop-in Group on Tuesdays Angel approached us for support. Her group, became known as “Angel’s Group”, before being renamed and receiving regular funding from the WDP addiction service. Our two community groups were invited to sit on the steering committee for a number of months until it achieved its present independence. Unexpectedly, RBK Housing changed their policy over the free use of community halls and they issued Angel with an invoice for advanced quarterly charge of £450. Fortunately, One Norbiton was in a position to donate their own free hours for six months to enable them to keep going until this problem was resolved. The idea of community groups collaborating with support Groups and RBK to improve the lives of the homeless seemed wholly appropriate. The maintenance of recovery from addiction and assisting the homeless to reintegrate with their community is proving an interesting model, and one especially suited to One Norbiton’s localism mission of improving the quality of life throughout Norbiton. This luncheon service for the street homeless then prospered and by Spring 2017 CREst’s Tuesday Mental Health drop-in service was expanded to include a similar service for the street homeless. This provided another day in the week when a hot meal was available. Throughout 2017, data on all those attending has been collected and this account has been prepared by MD’S by analyzing the signing-in books together with detailed questionnaires completed by a random 24% of the attendees who agreed to assist in upgrading a free self-help iPhone App for Addiction called I-bet-me.com. q.v. However, before this model can be viewed as wholly successful, we should await to see if it can genuinely help the reintegration of the homeless with our local community. After this it will be important to see if similar models can operate elsewhere. Free Food: Sandwiches etc. to take away and/or Hot food to eat in. Some food is purchased and cooked by the local support group funded by WDP the rest is purchased by CREst (our local community group with Charity status). Sainsbury’s Suri Basin and Prêt a Manger (transported by Des Kay of Save the World) provide free donations to CREst and we have had some private donations. We also are able to issue Food Bank vouchers. The donated food is distributed to the most needy and the rest is shared with the other group and the Everyday Church. Games: Scrabble, jigsaws and Pool. Where and when are services currently being offered? Locally; In RBK’s Piper and Queen Mary’s Community Halls on Tuesday and Thursday lunchtimes. The signing-in books showed that weekly attendance has generally been about 70. (monthly figures vary between 120 and 321). In all, 2463 hot meals were provided in the halls (and recently one of us (Angel) has been going out to serve some people hot food on the street at night). How many individuals attended during 2017 and who were they? A total of 345 attended on at least one occasion during this calendar year. There were 243 men and 102 women. Ages ranged between 25 and 62yrs They were multinational but mainly British. There was a large group of Poles but we also had Irish, Italian, Latvian, Hungarian, Japanese, Russian, North African, West African, Iranian and Spanish visitors. 18 of the attendees were helpers coming from WDP, Wellbeing, One Norbiton, CREst, The Joel Project, Local Councilors Speer KCAH Everyday Church. N.B. This differed considerably from the 16 suggested as the official figure, however, Homelessness is a complex and dynamic problem and we asked people to classify themselves as either “always,” “often”,” sometimes” or “never” homeless. Of those who attended saying they were Not now homeless 24 had a KT post code and 3 a TW post code. Surprisingly 13 (27%) of our 48 stated clearly that they were “Content” to remain Homeless. Because Addiction is known to be a major contributor to Homelessness, we offered attendees the opportunity to do research work to assist us in developing “i-bet-me.com” our new mobile phone App that offers support to addicts to stabilize or quit by awarding credit (CareCreds) for any actions they take to help themselves, their families, their friends and/or their community. 46% Reduced their spending on their bad habits. On average daily spending on addiction was £46.70 on entry but subsequently dropped to £29.30 a day. What other problems did the Homeless have? Pregnancy, Deep vein thromboses, Infected groins, Depression, Anxiety, Hypomanic attacks, Asperger’s syndrome, Dental abscesses, Abrasions, fractures and Sprains etc. There were real advantages in those at risk of relapse being monitored by people they knew so that i addiction services could be involved early whenever necessary. The use of volunteers makes this approach very attractive from a cost point of view. The importance of the local Authority providing a free venue cannot be overemphasized. The amount of money currently being spent on providing 70 meals a week is £55 (£ 2750 p.a.) a fraction of what is being spent on employee-based services. Homelessness is frequently making National news and here in Kingston, the Council is getting involved with two new initiatives; the first to support a team trying to prevent homelessness occurring and the second to set up a CBS or Community Benefit Society to create more access to housing for the 576 applicants on their Registers. Whatever actions ensue it is essential that they have all-party and community support. However, the model that is being constructed is focused on the better care of those currently coping with street homelessness in Norbiton. Our database has been obtained because of the collaboration of many volunteers. The active involvement of people who themselves have experienced addiction and homelessness has been the key to both the initiation and continuance of this service. Initial fears were that such an initiative might fail because some of our attendees might be so drunk or high that they would make the meetings unsustainable. However, as the months passed by we were struck by how much personal warmth and camaraderie exists on the street. Sadly, and unexpectedly, it has been the nervousness of the different bureaucracies and middle managers that has proved the biggest threat to the survival of this model. This was first seen in 2016, when they instituted unaffordable charges for using the Halls. And now in 2018 they have made another proposal that threatens the free use of the Halls by our two Community groups. Our interim analyses have confirmed that Homelessness is a complex, dynamic problem and consequent upon a series of individual, often tragic, life events. We have got to know over one in three of the attendees personally, and some have gone in and out of homelessness during the last 21 months. Over 90% of those we saw were suffering from addiction a condition that is still quite resistant to treatment with many relapsing after expensive detoxes. However, although it is clearly unfair to blame people for having acquired an affliction that damages their desire to change, it is possible for sufferers to exercise some responsibility for improving their health and some of our homeless increased their happiness and reduced their spend on addiction simply by filling in questionnaires making them reflect on how well they are caring for themselves and others. This has encouraged us to continue this research and to take it to the next stage of incentivizing addicts to earn CareCreds. We believe that this whole approach has shown great promise on many different levels and should be continued and tried elsewhere. However, Society is learning that criminalizing addiction is not only ignorant but expensive and counterproductive. Unfortunately medicalizing the problem is often not much better particularly now our NHS is overburdened. The community approach that this model is piloting seems a useful addition or alternative and using it we might be at least able to bring some relief to sufferers like Mike. •	The model of getting those in Recovery from addiction to work with local community Groups to assist the Homeless and seems to work. •	The biggest barrier we encountered was in persuading middle managers to be courageous enough not to block things. •	Our best estimate is that there are currently about 200 homeless living in or visiting Norbiton. Over 90% have serious addictions. 10% are female and their ages range from 24 to 64. They are Multicultural but mainly British. Although 27% claimed that they were content to remain homeless, the remaining 73% are much unhappier that other Kingstonians. They had a lot of physical and mental problems that make street dwelling especially difficult. •	Indeed 27% have life-threatening chaotic lifestyles and need more help. •	The complex problem of providing some winter day shelter should be explored by a consortium of our statutory and voluntary agencies. •	More initiatives are taken to find work for the homeless and a football team for them is started. •	The value of Incentivizing changed behavior should be explored. •	We hope to do future analyses of the effect of this model on the cost of local Health and Crime services. I am writing on behalf of our most vulnerable residents to thank you for your contribution to making the holidays bearable for them. On 28th December we hosted more than 30 people in Piper Hall where, thanks to all of you,they enjoyed Roast Beef and all the trimmings – beautifully cooked by the Grove public house – a choice of puddings and an atmosphere that was as close to ‘home’ as we could make it. In addition to practical support the moral support from Norbiton’s local councillors and MP was vital too. Offers of help and volunteer time played a huge part in creating the a community spirit in Norbiton that allowed such a successful event to take place. The HOMELESS -A Victory for Pragmatic Compassion! We have just heard that, following a petition set up by the Liberal Democratic party that attracted over 450 signatures, our RBK’s Resident Participation team is no longer refusing to let CREst and One Norbiton use Piper Hall to give hot food to the Homeless on the Thursday after Christmas. 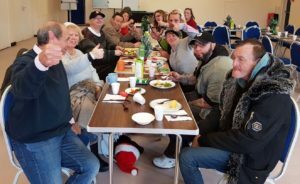 At a meeting on 26th September with Hall users, the Residents Participation team said that they would not open the Hall for the Homeless on the 28th of December because their team needed to have an undisturbed two-week holiday over Christmas. We then requested that Jill Preston be allowed to take responsibility and open up the Hall up without disturbing them. This too was refused despite our explaining that this had been permitted last year and that she had been responsibly holding the key for the past fifteen years. We are really grateful to all those who organized and signed the petition and got this decision reversed. So much has been happening recently that in order to keep you all up to date I am publishing a diary of recent events. 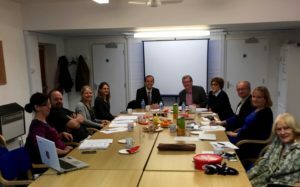 The Three Chairs Harry Hall (CRERA), Jill Preston (CREst) and Mike D’Souza (One Norbiton) met with Regeneration CEO, Marcus Carling and local political leaders to discuss the progress. Later the same day they meet Tom Copley from the GLA to get advice from him about securing the maximum number of Social houses in the project. Jill and Mike attended the final meeting of the local committee chaired RBK’s Neville Rainford to help manage Street Drinking. This approach of uniting the police, community groups, statutory bodies including addiction experts was generally considered to have been a success by all and complaints etc. have been considerably reduced. Jill and Mike attended a meeting of Hall Users called by RBK senior Resident Participation Officers, Simon Godfrey and Nina Baruch. This presented revised charges for use of RBK’s Halls. There was some disquiet that unlike last year Piper Hall was not being made available for giving the Homeless a Christmas meal. Jill assisted Cambridge Gardens residents to form their own group to represent their independent interests now that RBK have announced have proposed that they will be doing in-fill development in their Estate. The Three Chairs go to see the new Student “VitBe” building. This is very plush but we learned that some of our local lads had been pelting it with eggs. We promised to do what we could to stop this. 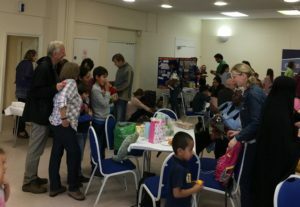 CREst and One Norbiton supported a very successful Family Learning day See Photo below. One Norbiton Directors met to discuss the legal and other aspects of accepting RBK’s restrictive terms for a one-year lease on the Hub. We are a bit bemused as to why our request to do minimal building changes and agree to a peppercorn lease is requiring expensive legal costs when the first issue of the Decant policy that affected thousands of residents was not even shown to lawyers. We have asked RBK for an explanation. The Three Chairs attend the full Council meeting to witness their Call-in being accepted and referred to a Task and Finish sub-committee. With the help of the Labour party, the Three Chairs met James Murray, Deputy Major of London for Housing, to discuss how the Mayor’s office might be able to protect the rights of those on the Estates during Regeneration. See the Photo I took of the meeting below. Real Communities need to meet and talk. How can this be helped? This project aims to improve conviviality both within our local estates and between the estates and their surrounding areas. We will recruit local volunteers to organise regular, perhaps quarterly, tea-parties in neighbourhoods sharing the same post-codes. We will train our recruits and support them in planning and advertising their events and finding suitable local venues. Wherever possible we will recruit volunteers with chronic disabilities to be the primary organisers in their own neighbourhoods. We have already successfully piloted such post code parties; e.g. getting attendances from 30% of the residences in a single tower block. Developing neighbourhood identity out of the sharing of the same Post Code has similarities to the successful Street Parties already taking place elsewhere in our borough on special occasions. However, we are exploring whether using this model can foster community spirit and get additional activities such as Neighbourhood Watch and WhatsApp groups as well as support for young mothers and the isolated elderly in areas of most need. Our long term objective is to evolve an urban village atmosphere across the Royal Borough of Kingston with “active and supportive” neighbourhoods that can help reduce social stress and the current need for and reliance on expensive and overstretched public services. We have found that when problems are known and talked about, natural human concern begins to operate spontaneously. Then the main task is to prevent this from becoming intrusive and a nuisance. In our model the arrival of New babies and of Newcomers to the neighbourhood will provide an opportunity for introductions. Supporting families with preschool children bereavements etc. would be a priority and Newcomers with limited English will be assisted and introduced to local charities such as LEAH (Learn English at Home) to help them integrate. By the second or third Postcode party a potential neighbourhood organising team might be identified who might regularly contact their immediate neighbours. These could be trained in ground rules to avoid intrusion etc. This process could be cascaded on to others. Wholesale Regeneration is being currently planned for our largest Estate. We hope that by developing supportive neighbourhoods it will help real co-design and co-production to be supported by our organisers at very little extra cost, aided and abetted by Digital Champions who may assist the disabled in their own homes. We will test our success using our Faces QoL tool used in our CareCreds App. i-bet-me.com.This will be available on tablets recording attendances and suggestions.